Dave Atkins (pictured) and Asia’s Hope are featured in today’s Mansfield, Ohio, newspaper. 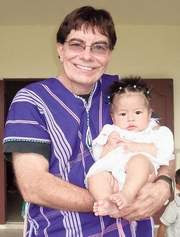 Asia’s Hope is an FGBC cooperating organization. Here is an excerpt–to read the entire article click here. LEXINGTON — With help from churches and caring people around the world, Dave Atkins’ dream has come true. The Wooster man said the venture was one he never expected to take on. In the early ’90s, Atkins said, the word “Asia” kept running through his head. At the time, Atkins was pastor at Grace Brethren.